This fascinating trip will make you discover the best places in Bali. In Komodo’s National Park, a UNESCO World Heritage center, you can approach the famous giant dragons in the wild. The seas around the island are home to some of Indonesia’s most exhilarating submarine life, and our tours offer world-class diving and snorkeling. Then the pristine beaches of Lombok are waiting for as a perfect end for your vacations. Arrival at Denpasar International Airport. Meet and greet at the airport and transfer to hotel. Overnight in Jimbaran. The beach and the bay of Jimbaran offers small secluded areas, where tranquility and peace are the perfect antidote to a stressful world. After breakfast transfer to Munduk. Before we will stop in Tanah Lot Temple, probably the most charismatic one of the island for two reasons: it is perched atop a rock dug by the strength of the tides . Our next stop will be Taman Ayun Temple, which is a landmark in the village of Mengwi. This temple complex boasts magnificent traditional architectural features throughout its courtyards and enclosures as well as expansive garden landscapes comprised of lotus and fish ponds. Our next stop will be Ulun Danu Bratan Temple is Located in Bedugul Village, the temple of the Lake Goddes at Bratan is one of Bali’s most visited and most spiritually important balinese temple. This Temple is dedicated to Dewi Danu, The Goddes of the Water and Bratan Lake, The Temple founded in 17th Century. its the focus of numerous ceremonies and pilgrimages to ensure supplies the water, the temple sits on the shore of the lake. Arrival and rest of the day free at your own leisure. After breakfast we will start our transfer to Ubud, the cultural center of the island. 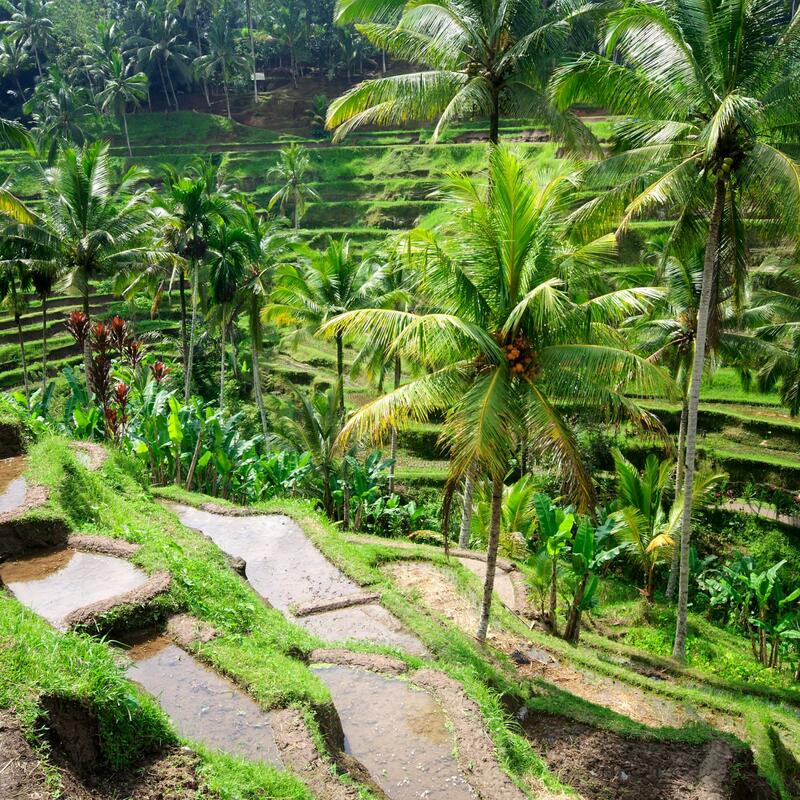 En route we will visit the rural area of Jatiluwih – in Balinese language this means really wonderful – where we will see one of the most beautiful landscapes of the whole island with never end stepped rice fields . In the afternoon you will arrive to your villa in Ubud. DAY 5: VISIT LOCAL FAMILY AND ENJOY A BALINESE MASSAGE! Today you will have the chance to see underneath to the real Bali. This experience will help you to understand the nature of these welcoming people. Spend the day with a Balinese family, be invited into their home to see and experience their every day lives. Your day starts early at the Ubud markets, where you can pick from fresh herbs & spices, crisp vegetables and choice cuts of meat, Ubud Rice Fieldbefore heading off on guided ‘padi’ expeditions. Upon your return, you will be warmly welcomed and expertly guided by the chef, who will help you to discover how to create your very own delicious authentic Balinese dishes. Mount Batur Bali is an active volcano that draws tourists in with both beauty and promise of Bali adventure Tours. We offers climb Mount Batur Bali to enjoy an unforgettable sunrise from the top of an active volcano. Spectacular scenery and the vibration of the sacred earth filling your mind and soul as u served by tasty morning breakfast cooked by the steam of the active volcano. Then back to hotel. Spend a relaxing day today exploring the village of Ubud. Its temple, market, the Monkey Forest…Just have a walk around Ubud and enjoy the magic environment of this villag. Transfer to the airport and flight to Labuanbajo. Upon arrival at Komodo – Labuan Bajo airport (west part of Flores Island) meeting service with our tour guide then transfer to harbor for boating 2 hours to Rinca Island by local wooden boat is modified to bring tourist. Arrive Rinca check in at the office then continue to explore with trek 2 hours around to see Komodo Dragon on their pure environment and some wild life such as Buffaloes, horses, deer, wild board and some kind of birds. After trekking you will go back to boat depart to Kalong Island to see flying foxes where they are coming out from mangrove trees as their home at 06.00 pm. Accommodation and dinner will be served on board. Depart to Komodo Island for other activities to see Komodo Dragons and wild life. Here, you have more chance to see wild board and deer that always passing monsoon forest. Then procesed to Pink beach for snorkeling and Manta point for snorkeling and swimming. If you are lucky will see Manta Rays hanging on the surface of the sea, sometimes swim with your around this area. Lunch will be served on boat.Bidadari island the best place for snorkeling with wonderful and colorful fishes. After activities you will go back to Labuan Bajo, arrive at harbor then drive you to your hotel. Overnight in Labuanbajo. At the arranged time, transfer to the airport and flight to Lombok via Bali. Our driver will be waiting for you and transfer to hotel. Accommodation. Free days at your own leisure! At the arranged time, transfer to the airport and flight to your next destination. Sampai Jumpa! VISIT LOCAL FAMILY AND ENJOY A BALINESE MASSAGE!